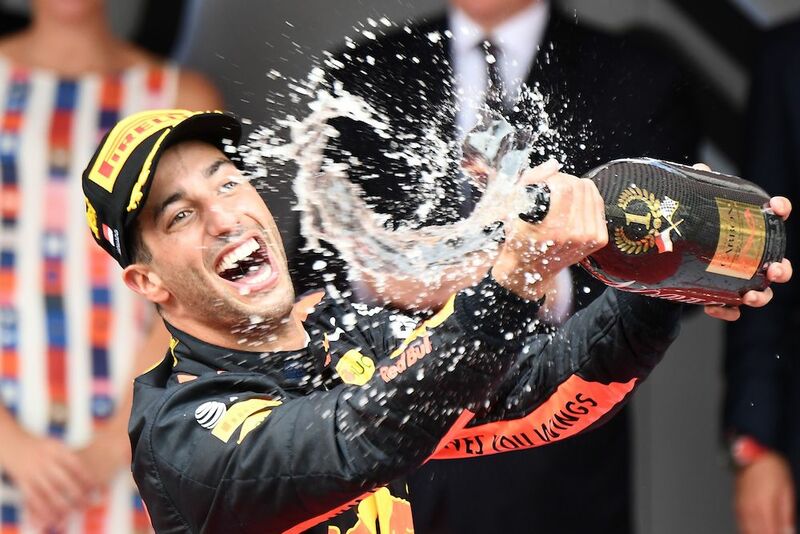 MONTE-CARLO, MONACO – Red Bull driver Daniel Ricciardo recorded his second win of the season, as he claimed victory at the 2018 Monaco Grand Prix despite experiencing an engine issue for the majority of the race. Two years ago, Daniel Ricciardo was supposed to win the 2016 edition of the Monaco Grand Prix but it all went wrong on the pit-stop and Lewis Hamilton claimed victory. The Red Bull driver looked just as dominant this weekend as in 2016 and he drove beautifully to secured his second victory of the 2018 season. However, the drive was anything but easy for the Australian. It had been a weekend where Ricciardo had topped the leaderboard in each of the practice sessions and during all three qualifying sessions. At the start of the race, the Australian seemed to be able to pull away from Sebastian Vettel and Hamilton with ease but managed the gap to ensure that pit-stop strategy was not compromised. After the pit-stops it was expected that the Red Bull man would pull away from his rivals but instead he seemed to be slowing down. The gap between him and former team-mate Vettel had reduced and suddenly, there was a flurry of radio transmissions. It was clear that Ricciardo had an issue that Red Bull were managing. The leaders were racing at a slower pace than those near the back of the field. At one point, Lance Stroll who was running in last place posted a faster time than that of the front five. However, it was not until after the race had concluded that what was wrong came to the fore. Ricciardo had lost his MGU-K, one of the power units, and therefore was losing over one second per lap. Formula One cars usually have eight gears at their disposal but Ricciardo was only able to use six of them. The Red Bull driver managed his pace and, thanks to the street circuit design, was never really threatened by Vettel. The German could not find an opportunity to overtake and as such crossed the line in second place with Hamilton finishing in third to complete the podium. Another race weekend and another mistake by Max Verstappen. Although the Dutchman produced a clean race, his position during it was severely compromised by what happened at the end of the final practice session. Ricciardo had posted the quickest time in both of the previous sessions but the Dutchman was right behind him. However, while completing his final runs in the third practice session Verstappen driver clipped the barrier at turn 15 which broke his track rod and meant that he crashed into the wall just a few seconds later when he was not capable of making the next corner. Red Bull were unable to fix the car in time for qualifying and instead of having two cars on the front row, which was a highly likely scenario, they now had one car at the front and one car at the back of the grid. During the race, Verstappen made several overtakes and managed to climb to ninth place to at least claim some points for the team but it was another weekend of what could have been. If Red Bull want to contend in both championships, then they need to be able to put a lot of points on the board consistently and Verstappen plays a big part in this. The Dutchman must reduce the amount of mistakes and kick-start his individual campaign, which will allow Red Bull to score points more often. The Milton Keynes based team are currently third in the constructors’ championship but are now sixty-one points ahead of Renault and 49 points behind Ferrari. Charles Leclerc became the first Monegasque driver to compete at the Monaco Grand Prix since Olivier Beretta in 1994. It looked to be a good weekend for the Sauber driver, who managed to make it into the second qualifying session for the third race in-a-row. Leclerc was battling away in the midfield, hoping to clinch the final point finish. However, it all went wrong on the 70th lap when he hurtled into the back of Brendon Hartley. Leclerc applied the brakes while approaching the chicane but they did not work and the Sauber driver moved close to the barrier but could not prevent a collision with Hartley. It was revealed after the race that a front-left brake disc failure was the cause and Leclerc was not penalised for the incident. Both cars had to retire from the race following the collision and that was Leclerc’s first DNF of the season. They joined Fernando Alonso, who also had his first DNF of the season, after he had a gearbox issue earlier on. It was an afternoon where Mercedes limited their losses on a circuit that they know doesn’t suit them. The reigning constructors’ champions still picked up 25 points through Hamilton’s third place and Valtteri Bottas finished in fifth. Mercedes did split tyre strategies to see whether they could force Bottas ahead of Kimi Räikkönen. Hamilton was the first of the front-runners to pit and caused a reaction among the front few with Vettel making his stop not too long afterwards. On lap 18 Ricciardo, Räikkönen and Bottas all made their stops but Bottas emerged onto the track with super-soft tyres on his car rather than ultra-soft. While the others were struggling with their tyre choice, Bottas was making ground on his compatriot and soon the top five were all within eight seconds of each other – partly due to Ricciardo’s engine issue. Bottas got within range of Räikkönen on several occasions but could not pass the Ferrari driver. Furthermore, it seemed as though both Ferrari drivers and Hamilton were struggling with graining on their tyres and if they had to pit again, Bottas would be able to take advantage. However, this never came to fruition and the Finn finished in fifth place. The Monaco Grand Prix in recent years has been more processional than full of overtaking and today was no exception. The tight nature of the street circuit means it is very easy to make a mistake but it is very difficult to overtake. Action has to come from other sources such as the weather, a collision or the pit-stops. The 2018 edition saw a surprising lack of action on the track. World champions Hamilton and Alonso described the race as ‘boring’ and ‘not really racing’. However, this seemed to be due to the tyre choices that were available this weekend. Pirelli provided the three softest compounds for this race weekend with the hyper-, ultra- and super-soft in use. Yet it was clear that the frontrunners struggled on the tyre with graining occurring, even when the drivers were not pushing as hard as they could. Will the title race continue to be between three teams at the next race? The F1 road show will carry on at the Canadian Grand Prix on the weekend of June 8th – 10th.